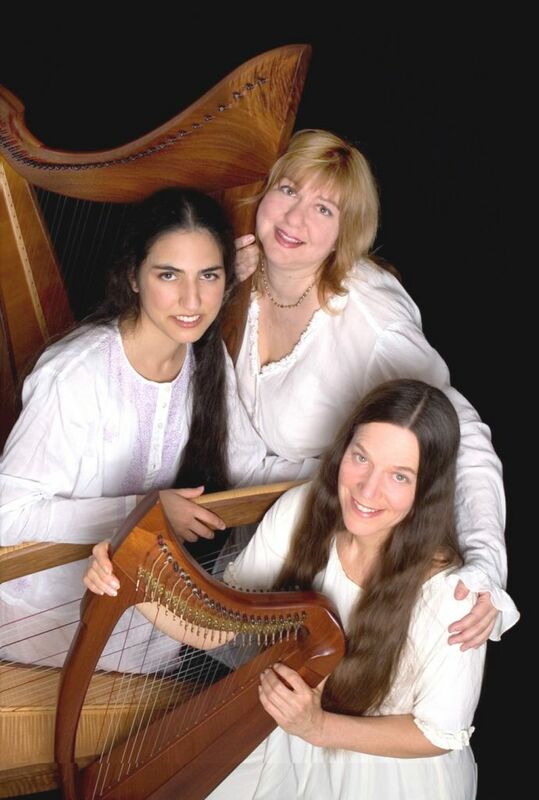 “Triskela”, a vibrant neo-Celtic harp trio — weaves a sophisticated tapestry of melodic intricacies with their original works and fresh interpretations of traditional Irish and Scottish folk music. From lively dance tunes to heartfelt ballads and stirring airs, Triskela members Diana Stork, Shawna Spiteri and Portia Diwa take you on a musical trip through the pastoral British Isles. 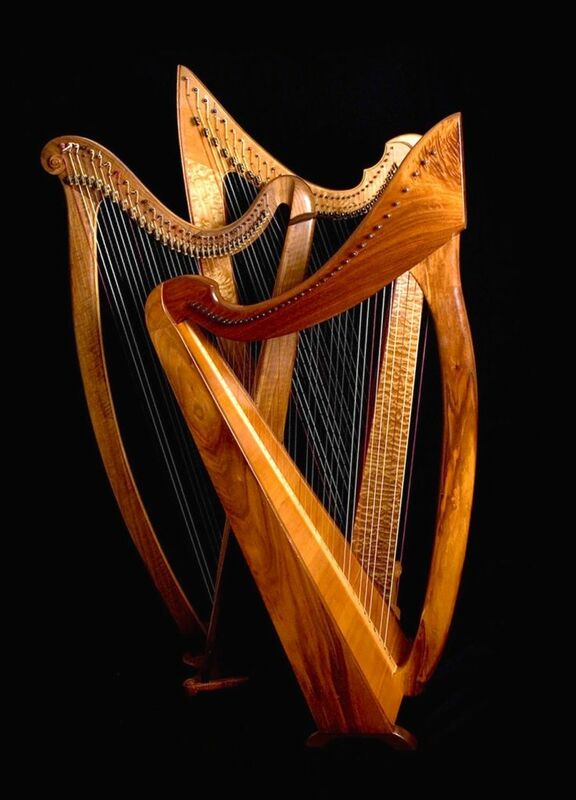 The stirring beauty of the harp is complimented by lyrical 3-part vocals, tin whistle, flute and traditional Irish drum. Triskela members have been playing together, on and off, since 1995 and have an active performing schedule. 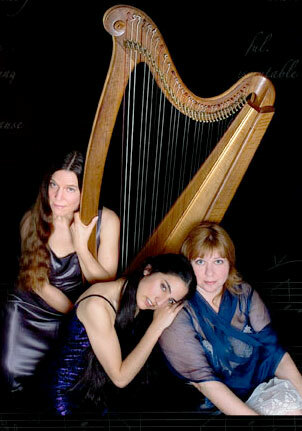 Triskela’s debut CD, “Voice of Tara” features the harp trio with guest musicians on fiddle, cello, and a variety of percussion. “Voice of Tara” is on the Elefunt indie label. Diana Stork is well known in the harp world for her unique style which incorporates ethnic and contemporary harp traditions. She has performed for such diverse groups as the Line’s Contemporary Ballet, the Maihar Orchestra of Maestro Ali Akbar Khan, and the Peace Ceremony of Zen Master Thich Nhat Hahn. She can be heard on dozens of albums, including “Harpestry” on Universal Records, and “Sacred Light” on the At Peace Music label. In 1998, she co-produced the successful CD “Celtic Harpestry” on PolyGram records which became a national PBS Special. She is founder and director of the Festival of Harps concert series, the Bay Area Youth Harp Ensemble, Mission Harp Ensemble and the national touring show World Festival of Harps. Shawna Spiteri, the trio’s singer and emcee, has been performing and making music in the Bay Area her entire life. With a degree in musical theatre from San Francisco State University, Shawna has performed with such companies as the Peninsula Civic Light Opera, Marin Civic Light Opera and the Palo Alto Players, and she has sung everything from madrigals to punk rock with the avant-garde quartet The Enormous Ensemble. She provided the musical accompaniment for Open Wing Theatre’s historical Irish play “Who Fears to Speak of ’98” and currently serves as the musical director for Bella Donna Venetian Courtesans, a Renaissance performance troupe. She has also helped direct the Bay Area Youth Harp Ensemble with Diana Stork. Shawna’s clear soprano voice compliments the sweet tones of the harp in a wide variety of styles. Portia Diwa started playing harp at age 9 and has been actively performing ever since. She is a founding member of the Bay Area Youth Harp Ensemble and also the Pleiades Ensemble – a quartet of talented young women who perform their own harp compositions inspired by Latin and contemporary music traditions. Portia is currently director of the Healing Harps program at the Institute of Health and Healing in Marin Co, CA. She is also director of the Mission Harp Ensemble, bringing folk music to underprivileged youth in San Francisco as Mission District. An avid composer, Portia also teaches harp and conducts workshops throughout the Bay Area.